The boreal forest in North America is a vast tract of coniferous and mixed coniferous-deciduous forest which stretches from the Atlantic Ocean to the Pacific Ocean across northern Canada and through Alaska. The Canadian portion alone is approximately 2 million square miles in size. At this size, the boreal forest represents one-quarter of the world’s remaining original forests. It has become increasingly clear in recent years that the boreal forest may well be one of the most important ecosystems in the world for birds, perhaps even as important as the great Amazon rainforests. Here are some facts about boreal birds from Bird Studies Canada. The boreal forest has a high level of bird diversity, with about 200 species representing 36 distinct bird families. Even though the boreal forest is a northern ecosystem, it has a higher level of bird species richness that do ecosystems further to the south. About 65% of all songbirds and forest birds in Canada are found within the boreal forest. For 40 of these species, more than half of their entire global population can be found within the boreal forest during the breeding season. Three-quarters of all warblers which migrate northwards to Canada spend the spring and summer months in the boreal forest. These 27 warbler species, which includes Yellow-rumped Warblers, Tennessee warblers, Magnolia Warblers, Blackpoll Warblers, Yellow Warblers, Chestnut-sided Warblers and Bay-breasted Warblers, represents approximately 1 billion birds. Some species are highly dependent on the boreal ecoregion for breeding. For birds such as Tennessee Warblers, Palm warblers, Northern Shrikes, Black-backed Woodpeckers, and Connecticut Warblers, over 90% of their global population nests in the boreal forest. 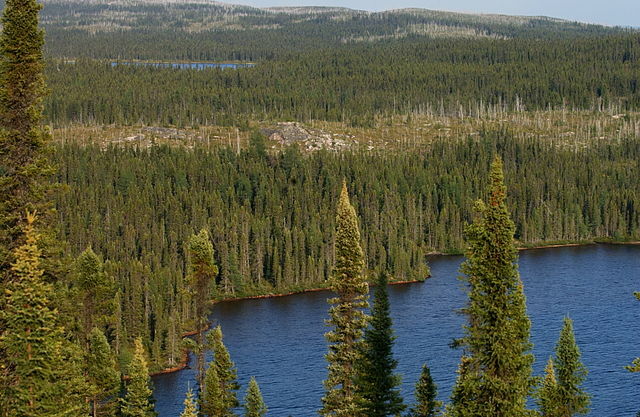 One of the main characteristics of the boreal forest is the countless ponds, lakes, marshes and wetlands scattered through the northern reaches of continental North America. These wetlands provided breeding and foraging habitats for 107 species of waterfowl, shorebirds and other waterbirds. As a result, about 40% of all waterfowl which breed in North America are found in the western half of the boreal forest. Most birds in the boreal forest region are migratory. While some species are year-round residents, about 5 billion forest birds and millions of boreal waterbirds migrate south each fall. About 1 billion birds, such as the various sparrow species, are shorter distance migrants and will winter in the United States. More than 100 million birds will winter in Mexico, Colombia and Brazil, mainly the boreal-nesting warblers and flycatchers. In fact, a look through the “Field Guide to Birds of Costs Rica” and the “Birds of Canada” will find that many of the same songbird species are in both books. Recoveries from banded raptors have indicated that many hawk and falcon species also winter in these countries, however several raptor species have been recorded migrating as far south as southern Argentina. Source: Importance of Canada’s Boreal Forest to Landbirds by P. Blancher. Commissioned by the Boreal Songbird Initiative and the Canadian Boreal Initiative, May 2003.